If you’re looking to celebrate Cinco de Mayo in New York City, look no further! This year, NYC’s Dos Caminos locations will be offering the ultimate fiesta with bites, including jalapeno poppers, tamale dumplings, poblano quesadillas, and more, curated by Executive Chef and Hell’s Kitchen winner, Chef Ariel Fox, and specialty cocktails mixed with Espolon Blanco Tequila. 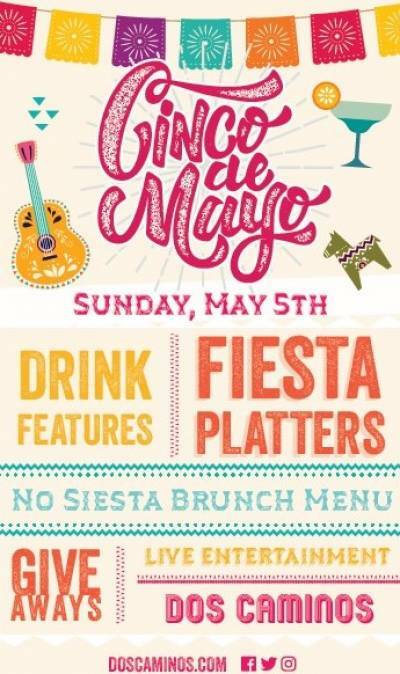 The fun doesn’t stop there, Dos Caminos locations will also have giveaways and live entertainment throughout the day. In addition, there will be a “No Siesta” Brunch menu until 4PM, including all the brunch favorites and a complimentary coffee or tea. For more information and menu details, click here: https://www.doscaminos.com/cinco-de-mayo/. Check out Dates for: Fiesta the Right Way on Cinco de Mayo at Dos Caminos!